Justice Minister Shaked: Incendiary kite launchers are terrorists, should be treated the same as those who launch rockets. Justice Minister Ayelet Shaked addressed the security situation in the south, the stability of the coalition, her relations with the attorney general and other issues on the national agenda in an interview with Radio 103FM Friday morning. 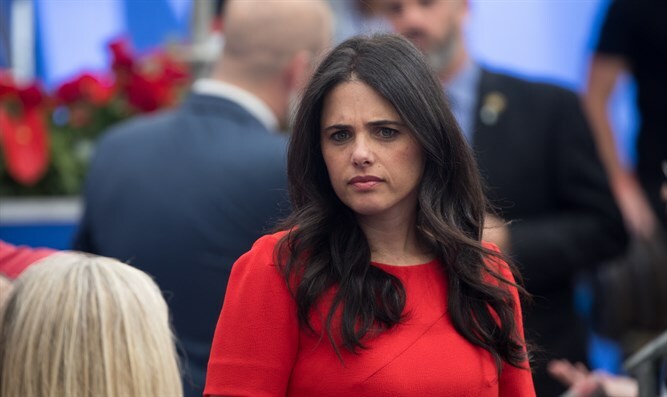 Shaked stated that the weekly demonstrations against Attorney General Avichai Mandelblit had no effect on his decision to indict Prime Minister Binyamin Netanyahu's wife Sara Netanyahu this week. "I know Mandelblit very well," Shaked said. "He is an honest and professional person who will make decisions only on the basis of existing evidence, and the demonstrations did not change anything." Asked if Mandelblit was hurt by the attack on him, Shaked replied: "It is not a simple thing for him, neither for him nor for his family, and people forget that they have a family. She added that whoever chooses a public career in 2018 should take this into account. "The discourse today is very violent, and everything gets a lot of resonance. The more violent and offensive it is, the harder it is." According to Shaked, the IDF should respond to those who fly incendiary kites in Gaza the same way it responds to those who launch rockets at Israeli cities. "If the State of Israel knew how to develop Iron Dome and deal with the tunnels, then I think there will also be a solution for kites in the coming weeks," she stressed. "These are not kite flyers, but rather terrorists who have found a new way to ignite the south." "This is terrorism, for all intents and purposes." The interviewer asked: "Are we facing Operation Protective Edge 2?" Shaked responded: ""If Hamas is going to deteriorate the situation, it is a real possibility, even though no one is really interested in an escalation." She was also asked about the Draft Law and the fears that the controversy over the law would cause the coalition to collapse. "There is no reason to go to a coalition crisis," she explained, "There is no single law that comes into Knesset and leaves in the same form. I have been working on the law for eight months and I have made a lot of changes - and I am sure we will succeed in passing the law on its first reading."